Scotland manager Gordon Strachan has hailed Scott Brown as a role model as the captain prepares to win his 50th cap. The 30-year-old will skipper Scotland in their Hampden friendly against Denmark on Tuesday night, more than a decade after winning his first cap. Strachan signed Brown from Hibernian while Celtic manager in 2007 and made him his Scotland captain after Darren Fletcher was sidelined by illness. The Celtic skipper also helps coach his club’s under-20s team and Strachan is seeing his influence on players coming through. Strachan said: “He’s been a big part of my career over the last 10 years and he’s made my life more enjoyable, that’s for sure. More interesting, on many occasions. “Scottish football would be a duller place without Scott Brown. “I can see his influence around younger players now, which is terrific. He has not only been a good footballer, but a good help to young players. “He’s good with people, he likes being with people, he makes everybody welcome in here. “And then he trains to a maximum. Anything he does is to a maximum, no short cuts. Brown had a goal disallowed on his debut, in a 1-1 draw with the United States in November 2005. As Brown joked, his combative nature has remained intact, but he has matured into captain for club and country, something he could not envisage during his formative years as a footballer. Brown revealed Strachan has been the biggest influence on his development. The midfielder looks set to remain at the heart of the Scotland team for the next World Cup qualifying campaign at least, but there is fresh competition for places in Strachan’s set-up. 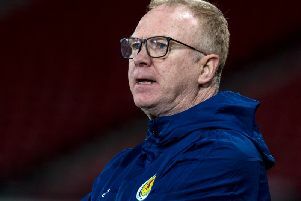 Five more uncapped players come into the reckoning against Denmark - Kieran Tierney, Jamie Murphy, John McGinn, Oliver Burke and Liam Cooper - after Paul Caddis and Tony Watt made their debuts during the 1-0 win over the Czech Republic on Thursday. And Brown has welcomed the fresh impetus from the younger talent. “You realise you don’t run about as much as they do,” he said. “They have been great. “You usually think they are going to be shy and sit in the corner but they have done really well in training and in team meetings as well. “They are loving being here, especially with a manager like Gordon, they are learning a lot throughout the week’s training. “That’s what is good about the manager, he is never stuck in his ways, he is always looking to improve, whether it’s new faces, a change in formation or looking to change the way we play.